Dennis Choi is Professor and Chair of the Department of Neurology and Co-Director of Stony Brook University’s Neurosciences Institute. The physician-scientist is a co-discoverer of the physiological mechanism of action of benzodiazepine drugs, a class of drugs used to treat conditions such as seizures, anxiety and muscle spasms. 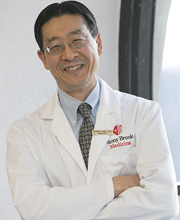 Dr. Choi is also a pioneer in dissecting processes responsible for pathological neurodegeneration. He holds seven patents for innovative neurological research, and has served as an advisor to the National Institutes of Health, Federal Drug Administration, and National Academy of Medicine. Why did you select your field? I went to college planning to study engineering but was progressively won over by life sciences and then neurosciences. I found the prospect of learning something about how brains and minds work enthralling. How could three pounds of tissue be self-aware and have hopes for mankind? I saw medicine as a chance to combine the intellectual side of neuroscience study with the practical, humanistic, here-and-now goals of patient care. Given my interests in neuroscience, it was logical for me to go on after medical school to specialize in neurology. Why choose to work at Stony Brook? What is the opportunity here? Stony Brook is a special place, a nationally-recognized research institution with a collaborative culture. Its Neurology Department is clinically excellent and responsible for delivering neurological care to a large number of people in Suffolk County. School of Medicine Dean Ken Kaushansky recruited me to lead this department; specifically, to further strengthen clinical services while developing several new high-impact research programs. I enjoy the challenge of building up organizations, and I feel privileged to have such an opportunity in an institution as eminent as the Stony Brook University School of Medicine and Stony Brook University. I enjoy the opportunity to contribute to society while doing a range of engrossing professional activities. My current focus is on translating advances in basic neuroscience into clinical improvements, and guiding junior researchers. I find research mentoring very fulfilling. In the past, I have directly trained more than fifty students or post-doctoral fellows in my own laboratory. Half this group now holds senior faculty positions in universities around the world, while others occupy staff positions in institutions such as the National Institutes of Health. What breakthrough would you most like to make? I would like to contribute personally to the development of diagnostics or therapeutics that are useful in diagnosing or ameliorating nervous system diseases. I would also like to aid the development of key research tools called “biomarkers.” These are conveniently measurable readouts of a disease process that can facilitate the discovery of new diagnostics or therapeutics. What might your field look like in the year 2020? Although the brain is by far the most complex part of our bodies, brain science is now maturing in a very exciting way. We are now able to identify component parts and processes with precision, and begin to figure out how these parts come together to create our minds. A key development has been the use of magnetic resonance imaging (MRI) to display brain structures and identify regional brain activation (modern MRI technology was made possible by ground-breaking work carried out by Stony Brook Professor Paul Lauterbur 40 years ago, work recognized by a Nobel Prize in 2003). And President Barack Obama has called for a national neuroscientific effort to map the human brain, down to the level of the tiny individual connections between nerve cells called synapses. I anticipate that by 2020 we will have learned a great deal more about the mechanisms of common brain diseases such as Alzheimer’s, stroke, traumatic brain injury, epilepsy, Parkinson’s, autism, schizophrenia, sleep disturbances, and depression. I think it’s likely that we will by then have developed a several new ways to diagnose or treat certain brain diseases, with a growing number of therapeutics visible in research pipelines. There is however a major threat—the current de-prioritization of neuroscience-sector drug development by pharmaceutical companies, driven by return-on-investment calculus. I am hopeful that changes to governmental policies, regulation, or patent law to rebalance financial incentives will ensure that ongoing discoveries in neuroscience are translated into therapeutics in a timely fashion to benefit patients. If you could send one message to the community about your field, what would it be? Recent data indicates that more than fifty million Americans suffer from brain diseases. Almost everyone, myself certainly included, has personal experience with a major brain disorder, either in themselves, an immediate family member, or a close friend. My message would be one of optimism—although the road to needed new treatments is long, it is becoming defined, and we will get there. Do you have a trait you are willing to share, as a window into your personality? I think I am a chronically curious person. This curiosity serves me well as a researcher, makes me a better physician, and shapes my approach to life in general.